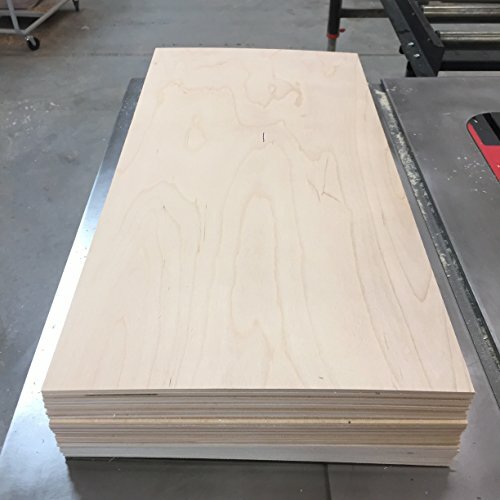 1/8'' (3mm) Baltic Birch Plywood 12'' x 24'' sheets by Wood It Is at HoldUp Art. Hurry! Limited time offer. Offer valid only while supplies last. Here are 23 Baltic Birch Plywood Sheets - Grade B/BB - the highest quality, perfect for laser cutting / engraving or rotary engraving / cutting. Here are 23 Baltic Birch Plywood Sheets - Grade B/BB - the highest quality, perfect for laser cutting / engraving or rotary engraving / cutting. Measures 1/8" thick - it's actually called 3mm because that's how Baltic Birch is manufactured. Laser cuts extremely well with nice, smooth edges. These sheets also work extremely well with crafting, doll house building, jig making, and other woodworking applications. 23 sheets per box, shipped USPS priority mail. Actual Measurements: 23.75" x 11.75" A Full Large size USPS flat rate box, completely full - this box usually holds 24 sheets, but the Baltic Birch is ever so slightly thicker, so only 23 sheets will fit into this large box. I have tried many different suppliers of Baltic Birch and they all differ in laser engraving quality. This Baltic Birch cuts at the fastest speed compared to others I've tried with a nice tan edge, even with lower power lasers! Ships USPS Priority 1-3 Days.